After some discussion with the group, for our Call of Cthulhu game we decided to bring back some characters from our campaign which took place in 1918-1919, beginning with an adventure set during the Great War (Chaosium's No Mans' Land). I've been giving some thoughts as to the best way to do this. It's been about two years in real time since we last played that game. I'm definitely going to take advantage of that gap and will be introducing a one to two year gap in the game as well, pushing the timeline to 1920 or 1921. I think the passage in time can be used for a number of purposes. “Arkham,” Atticus said. “The letter says Mom’s ancestors come from Arkham, Massachusetts.” Arkham: home of the corpse reanimator Herbert West, and of Miskatonic University, which had sponsored the fossil-hunting expedition to the mountains of madness. “It is made up, right? I mean—” “Oh, yeah,” George said. “Lovecraft based it on Salem, I think, but it’s not a real place . . . Let me see that letter.” Atticus handed it to him and George studied it, squinting and tilting his head side to side. “It’s a ‘d,’” he said finally. 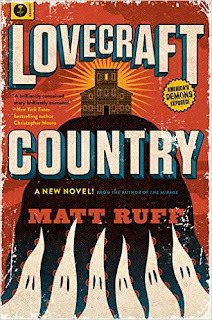 Matt Ruff's Lovecraft Country is an unusual novel - it is a collection of interconnected tales about Atticus Turner and his friends and family in the 1950s. Andrew Wood. Kurt Cobain. Layne Staley. Scott Weiland. And now Chris Cornell. Grunge music really took off late 1991, the start of my junior year at the University of Connecticut. I graduated in May of 1994 (taking five years due to time spent on co-op). For the second half of my time at UConn, the likes of Nirvana, Pearl Jam, Alice in Chains, Stone Temple Pilots, and Soundgarden provided the soundtrack. I loved classic rock like the Beatles and Queen and I'd yet to fully discover the greatness of David Bowie. But the grunge music of the early to mid-1990's inevitably brings me back to my early twenties. I don't think I could ever explain what a seismic change those opening chords of Smells Like Teen Spirit marked for many in my generation. And now so many of them are gone. It's not a unique phenomenon - earlier generations experienced the losses of the likes of Jimi Hendrix, Jim Morrison, John Lennon, and Janis Joplin. 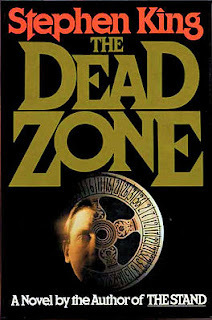 It's been a long time since I read Stephen King's The Dead Zone. I believe I received it as a Christmas gift in a boxed set back around 1987. First published in 1979, The Dead Zone isn't really a horror novel - it is more a crossover of a political thriller and a tale of a man gifted/cursed with psychic powers. What I found striking was how the book both worked as a period piece and how it is relevant today. It tells the story of John Smith - yes, that's his real name. Ever since an accident he had as very young boy (one he has no memory of) he's had the occasional psychic flash. This is illustrated in the beginning of the novel, set in October of 1970, where he and his girlfriend Sarah, both first-year teachers, are at a carnival and he has a wild streak of luck at the wheel of fortune. However, his luck soon turns ill as he gets in a car accident which puts him in a coma with nearly no chance of recovery. 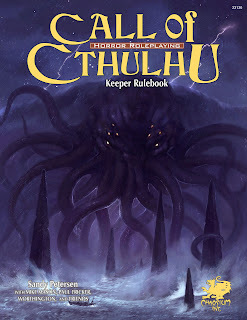 After some discussions with my gaming group and time spent in creative pondering it appears that up next is some form of the Cthulhu Mythos. I'm in the process of drilling down to see just what that means. We could continue one of two previous campaigns, a traditional 1920s game and a pulp Gaslight-era one. While the Gaslight-era was fun, my inclination is to return to a more traditional 1920s or 1930s period. New characters might be in order as our group has gotten a bit smaller since then (truthfully I found the group a little too large for Call of Cthulhu though it did help when the body count got high). I'm considering three possible campaigns. 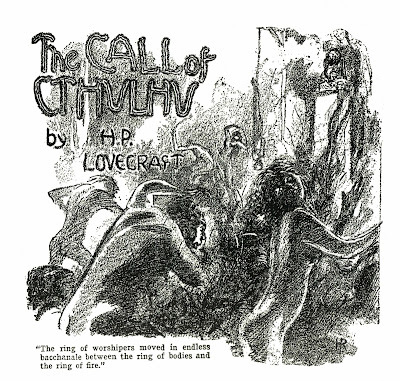 The first is your "traditional" 1920-something era campaign, most likely set in Lovecraft country. I found my players tend to do very well when faced with the "impossible" odds a normal Cthulhu game presents. That's not to say such a game is safe - far from it. The Encyclopedia of Golden Age SuperheroesCthulhu and Zombie Mugs and Cups Production Run!The Dracula Dossier - I'd actually received almost all of the rewards ages ago but there was one final reward, The Hawkins Papers, which recently arrived, closing this out. Pelgrane kept the backers well-informed as to what the issues were and their statuses.Blue Rose: The AGE Roleplaying Game of Romantic Fantasy - Like The Dracula Dossier, I wasn't particularly worried about this one. I've had the PDF for a while and was kept well-appraised as to what was going on. 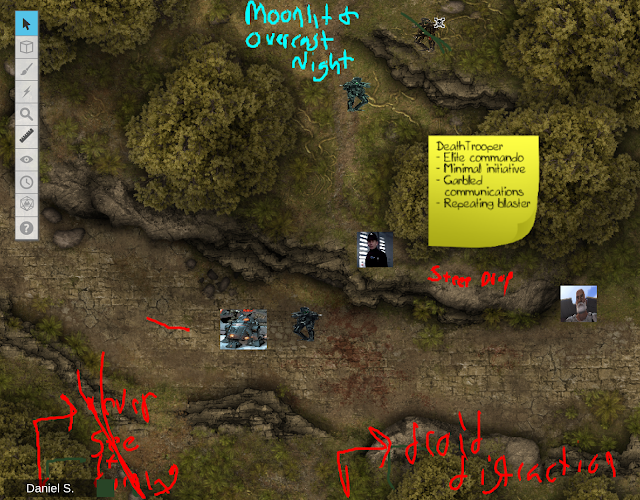 Last night we wrapped up our Fate Accelerated Star Wars game, at least for the time being. 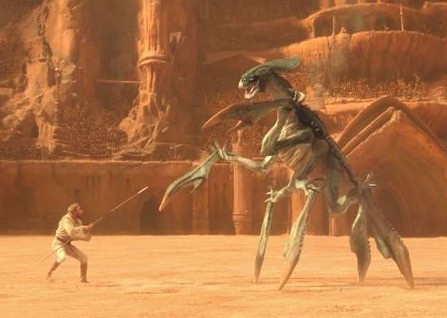 We ended at a good breaking point, with our heroes escaping from Alderaan as the Death Star destroyed it and broadcasting footage of this act of terror across the galaxy. Sure the Empire initially wanted to be very public with the Death Star, but after its destruction they'd have preferred keeping it hush-hush. It's hard to intimidate the galaxy with a weapon you no longer have. A write-up of the adventure itself will be forthcoming but since we decided to try something else next game (with the option to come back to it at a later point) this is a good time to reflect on our first completed Fate campaign, albeit a short six-session one. I've played and run Fate games in the past but this is the first time we kept on to a conclusion. The Rebel operative code-named Prodigal One has crashed in his Y-Wing on the planet NCW-781. This agent had been gathering intelligence information about double-agents embedded within the Rebel Alliance. Gaven Stark, Marcus Doha, and R2-C4 have been dispatched on a U-Wing fighter to NCW-781 to retrieve Prodigal One's information and, if possible, the agent as well. While the Alliance has managed to distract an imperial Strike cruiser into leaving the system, elite Imperial Deathtroopers are searching for Prodigal One. It's been a rough journey for Luke Skywalker. He's gone from "I am a Jedi, like my father before me" to "it's time for the Jedi to end". With The Last Jedi not out for several months I find myself unable to avoid some fanboy speculation regarding Luke's declaration. It seems unlikely that Luke is totally ending the idea of an order of Force users who protect the galaxy. 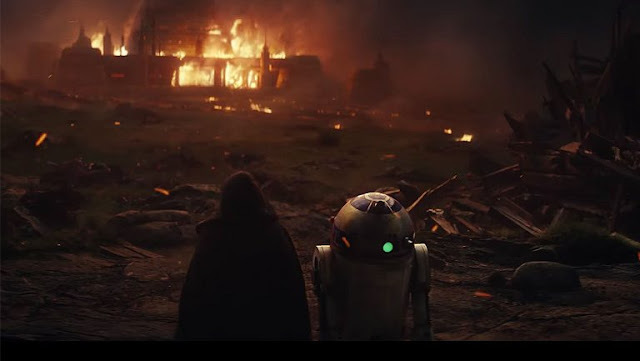 After all, from the teaser we can see he is training Rey. There's been some speculation that he'll bring balance to the Force by embracing both the Light and Dark Sides of the Force. I think there's something to this, but not in the sense of some order of "Grey Jedi". I'm pretty certain that Luke will remain a good guy - he was tempted by the Dark Side of the Force and survived by learning not to fight. How Is Fate Working for Star Wars? I've had the opportunity to use every official Star Wars RPG out there. I've played all three incarnations of the West End Games Star Wars RPG, all three of the Wizards of the Coast, and an Edge of the Empire Game that borrowed material from Age of Rebellion and Force and Destiny. I've had fun with all of them and if I were in another group that proposed any of those games I'd be fine playing any of them. 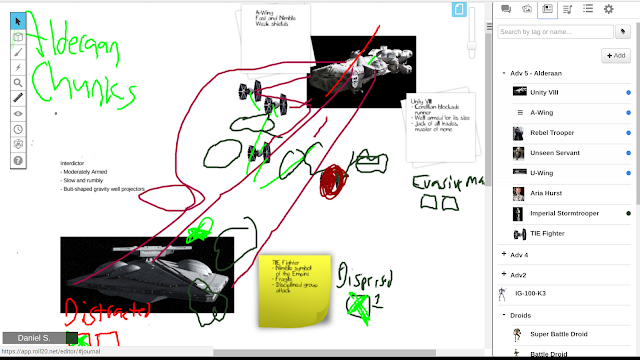 It was a bit unusual for me to take a stab at going my own way with a home-brew Star Wars game. I'd thought about using Savage Worlds in the past and did a one-off Wushu Star Wars game once but Fate was a bit out there for me given my earlier experiences with it were a bit so-so - I liked it but I was unable to really grok it.